No moody black and white image today, just a simple color shot of a wonderful automobile. This shot shows the exhaust pipes of a 1935 Auburn Speedster. The Auburn was manufactured in Auburn, Indiana and was noted in its day for being a high performance automobile. Before a customer received their automobile, it was certified to have been tested to 100.8 Miles Per Hour by Ab Jenkins a professional race car driver known for setting speed records at the Bonneville Salt Flats in Utah. 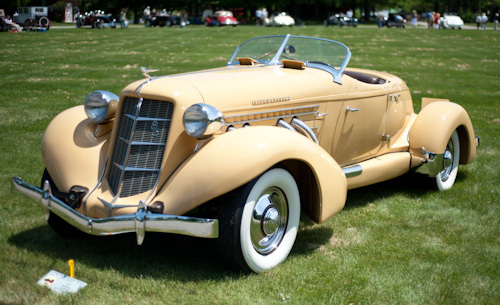 I’ve always liked the look of the Auburn Speedster. 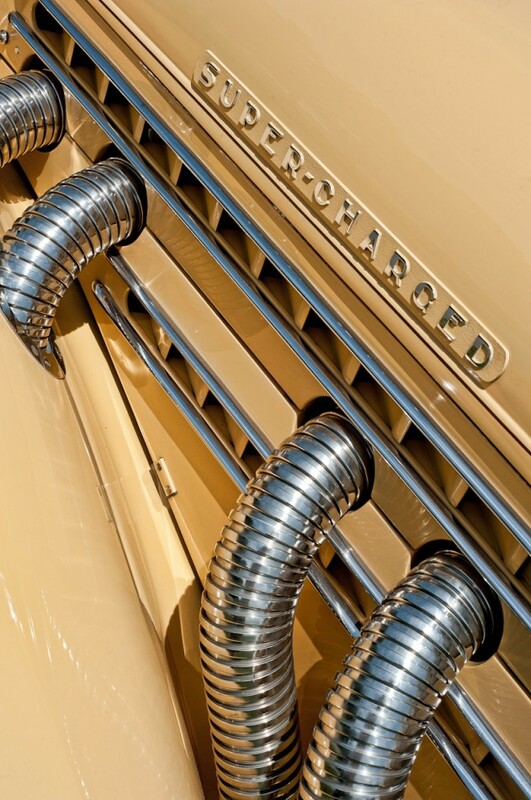 There is something about the chrome pipes coming out of the engine that just looks cool and exudes speed. Here is a full body shot of the Auburn. I screwed up when I took this shot because I had my aperture set to f1.8 which meant that much of the car was out of focus. There wasn’t much processing done to the finished image. I made some minor exposure tweaks in Lightroom and used Topaz Adjust to pull out a little bit more of the fine details in the image. The lines on autos from this era were so great! Another great shot James! Thanks, I really like the details on automobiles of this time period. Unique cream color. Great detail of the chrome pipes. I’ve seen a few of these cars in this color. Must have been popular. I think the color was probably original even if the car was restored, but I don’t know for sure. Wow, this is absolutely breathtaking James! You can see the lines here, and how they influenced sports car design. Love the color of the car and that Super-Charged badge is totally awesome! You can buy a ‘new’ version of the car from some outfit in Florida, I think. I believe they bought the designs and the build new ones with new features like air conditioning and other modern updates, but they look pretty much like the original. The design definitely influenced later cars. Thanks for checking it out! Nice image, James. I’m wondering if originally the “Supercharged” badge would have been chromed? I’m pretty sure it is chromed, I think the chrome is reflecting the paint and it makes it look like it was painted. Oh man, this is a fantastically composed image! Love those pipes!